This super spicy Sichuan Chilli Oil is one of a few varieties of Chinese chilli oils we make at home. They last a good few months in the fridge, and so I always have at least a couple of them at hand. What differentiates today’s recipe from the others is the addition of sichuan peppercorns and star anise, resulting in a slightly different final flavour, beside the spice. Click more to read about sichuan peppercorns. I am hoping, over the next few weeks, to also add a couple more chilli oils to the list here on LinsFood, so look out for them. If you miss out on any chilli posts, you can always just head on over to the Chilli Page to catch up. Our recipe today is pretty straightforward to make, mine has some chilli powder to the mix for depth, something you won’t find in store bought jars. However, we do not cook the chilli powder nor the chilli flakes, as this will result in a burnt and bitter flavour. You’ll see. How do I use this Sichuan Chilli Oil? When you want to use it, give it a stir, then scoop out some of the oil, with all the bits; I have to warn you, you’ll get addicted very quickly! You could also just scoop out the oil, if you want, to drizzle or to use as a stir fry oil. With bits or without – completely up to you, depending on your mood and what you are using it for! For one thing, it makes a very convenient condiment. 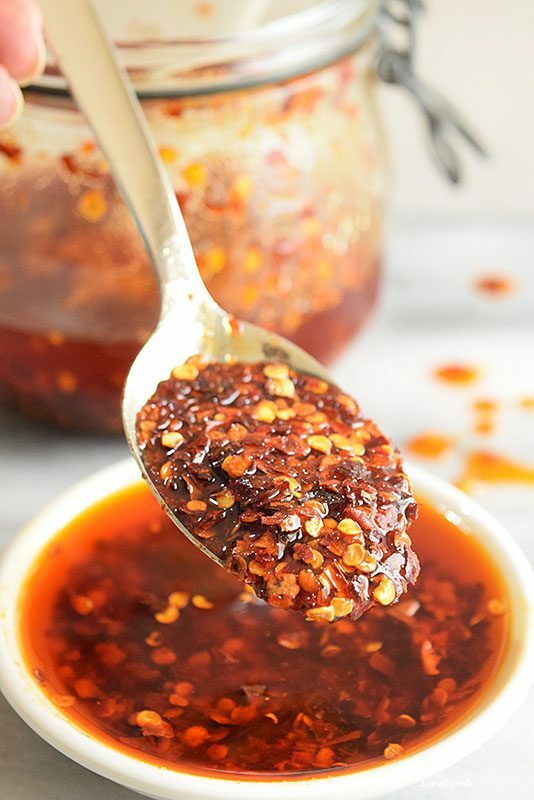 As I cannot have a meal without some sort of spice, the Sichuan Chilli Oil makes a great flavour and spice enhancer at meal times, much like the sambal belacan does. I also use it in stir fries. When a recipe calls for chillies or chilli paste, just use this Sichuan Chilli Oil, with the actual oil substituting the oil in your recipe. The result is a fabulous, deep and spicy dish. I love to spice up mayo and aioli with this chilli oil, when using them as dips or in sandwiches. 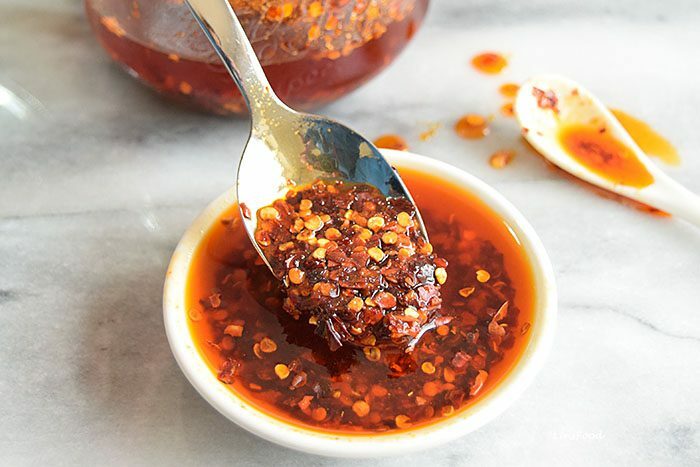 Speaking of sandwiches, oh man, just lightly brush your chosen bread with a layer of this Sichuan Chilli Oil, whatever filling you have, and you’ll be in heaven! As part of a marinade, it adds oomph to any baked or roast dish you’re planning. For eg, add a tablespoon (or more) of this to our Sichuan Roast Chicken, for an even spicier result. And it is also the defining ingredient of a favourite Sichuan dish called Kou Shui Ji (aka Saliva Chicken), sometimes better known as the awful sounding Saliva Chicken! Cut the whole dried chillies in half, using a pair of scissors. Place the oil, ginger, star anise, cinnamon stick, bay leaf, cut dried chillies and sichuan peppercorns in a saucepan and heat on medium-low heat. When the oil comes to a simmer, lower the heat right down and simmer for 15 minutes. While waiting, place the chilli flakes, chilli powder and salt into a bowl large enough to take the oil and set aside. At the end of the 15 minutes, by which time the oil has had a chance to absorb all the aromas and flavours of the aromatics and spices, turn off the heat and leave to rest for 5 minutes on the hot hob. 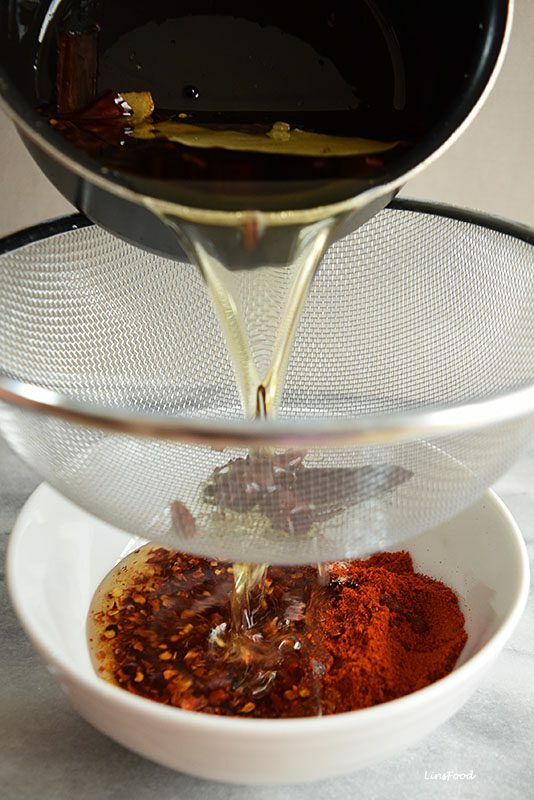 Using a metal strainer (as the oil will still be hot), strain the oil into the bowl of chilli and salt mix and stir well with a metal or wooden spoon. Transfer to a sterile jar and when cooled to room temperature, store in the fridge for up to 6 months. This is awesome, thank you. I saw your advice re fresh chilis, will give that a go. Do the chilis need to be dried? I have about a quarter pound of fresh picked bird’s eye chilis and would love to use them in this. The traditional Sichuan chilli oil uses dried chillies, but there is no reason why you can’t use fresh ones to make a chilli oil like this. I make different types of Chinese chilli oils using fresh chillies. Oh this looks and sounds amazing! I love anything spicy and definitely going to make this at home. Wow that’s pretty easy! I like this condiment and I always thought that it needs some sort of special skill to concoct it, but look at this, it’s pretty simple! Great! Definitely my favorite. Had been wondering how to make the chilli oil.. and imagine my joy finding this website after many tries. I love love love Sichuan Chilli oil but would have never thought to make it at home. Great recipe and tutorial, I need to give this a try! As much chili as I eat, I should definitely learn how to maek it. Looks yummy! This looks delicious and I love the fact that it will keep for a while in the fridge. My boyfriend needs chilli oil on everything so Ill have to make him some! Always handy to have some in the fridge! I’m so excited to find this recipe. I love the flavor of the chili oil at my favorite Chinese restaurant, but I’ve never been able to replicate it at home. I hope I’m able to find everything on your ingredient list. Thank you! My goodness there is a lot of spicy ingredients in this! I cannot eat spicy foods, but this is right up my husbands alley. I am going to show this to him cause I know he would love to make this oil for himself! This sounds like a good oil to spice meals up. We usually don’t like spicy foods, but some spice is good when it contributes to the overall savory taste of a meal. I know someone who will love this sichuan chili oil. I will also try this. I’m pretty sure that my husband will surely love this. I’ll make sure to make this one for.him. I keep this recipe for myself. I like Sichuan food. I used to buy the oil from a local store. I love spicy food and this would be great for any meals. I would like to try this for sure. Oh my! I can imagine the smile on my family’s faces when I share this. We really love spicy foods or dips. This will be really good! I didn’t know it was this easy to make! I bet it is delicious on veggies. My daughters and I enjoy spicy food and it would be nice to make homemade chili oil! I didn’t know that it wasn’t that difficult to make. Thanks for this one. Thanks for the recipe. I always wanted to do this. I love dipping most of my meals on Chilli Oil. I never had this before. It looks good, though! I would love to try this for sure! Gotta love being able to make your own sauces! This is something I’ve never tried to do! Might have to try that out in the future for a nice kick or finishing touch to some meals that we make! This sounds like it would be a nice topper for tacos too! As a Nigerian, Hot goes with everything yet I did not know this existed. Would be really nice to try. This would be great to have on hand for my cooking. I do like some spice in my food. The ingredients sounds delicious, especially the chili flakes, peanut oil, cinnamon stick, and ginger. I think this would be a great way to spice up a marinade for a roast! Thank you for the recipe. I have never heard of chilli oil and it makes so much sense because I am not one for chillis or anything remotely hot but the rest of my family just love it – so they can mix a bit in – and as you can make it up and store in the fridge I wont need to make it every time I cook. we do not familiar with chili food but this it sounds delicious taste, I am so curious to try it now, oil is always at home It will be great to change some time. That oil sounds ah-mazing. I would use this on so many things. I must try this.